President Trump expressed deep skepticism about mainstream climate science in his first international TV interview since taking office, making incorrect statements about global temperatures and Arctic sea ice. 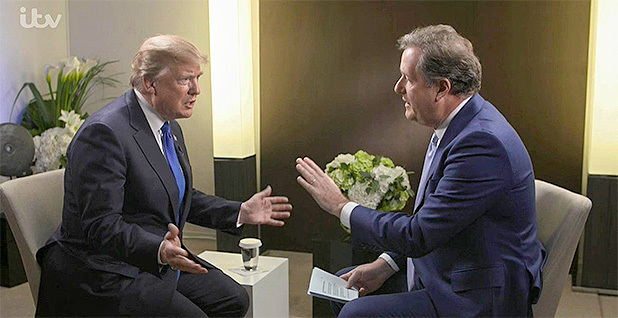 The statements, made in an interview with Piers Morgan during the World Economic Forum in Davos, Switzerland, are some of the lengthiest Trump has made on climate change since his inauguration more than a year ago. They suggest that his time in the White House hasn't corrected his views on global warming. Trump has amplified misinformation related to climate science over the years — primarily through Twitter — and he resumed echoing debunked concepts yesterday. "There is a cooling, and there's a heating. I mean, look, it used to not be climate change, it used to be global warming," he said in the interview, which aired yesterday on ITV. "That wasn't working too well because it was getting too cold all over the place." The world, in fact, is getting warmer — not colder. Global temperatures are steadily rising. NASA and NOAA said that 2017 was the 41st consecutive year of above-average global temperatures and that the pace of warming has accelerated. NASA recently identified last year as the second warmest since record keeping began in 1880, while NOAA said it was the third warmest — a notable feat given the lack of an El Niño, which typically raises temperatures. This year is likely to be in the top five warmest years ever, if not the top two, according to NASA and NOAA researchers. The warmest years on record are 2016 and 2015. Trump's comments came as his administration is readying an infrastructure push that will aim to repeal provisions of major environmental laws. The administration also has pursued a deregulatory agenda to boost fossil fuel production, hoping to usher in a period of "energy dominance" that wields energy exports as a geopolitical and economic tool — a message he and his Cabinet took to Davos last week. "I believe in just having good cleanliness in all" regarding air and water pollution, Trump said in the interview yesterday. He also reiterated his disapproval of the Paris climate accord. But, as he has in the past, Trump said the United States might remain in the global pact under the right terms. "First of all, it was a terrible deal for the U.S. If they made a good deal, there's always a chance we'd get back. But it was a terrible deal for the U.S. It was unfair to the U.S.," Trump said. "If somebody said, 'Go back into the Paris accord,' it would have to be a completely different deal, because we had a horrible deal." Trump signaled an intent to withdraw from the Paris deal, but the United States cannot formally exit until November 2020. If Trump fulfills his pledge, the United States will be the only country in the world outside the Paris Agreement. And while Trump has remarked about forcing different terms in the accord, he has not offered any details on what that means, and other nations have said they won't renegotiate the pact. One reason Trump might consider remaining in the agreement is his relationship with French President Emmanuel Macron, Trump said yesterday. Macron has made addressing climate change a priority for his administration, following France's role in establishing the global pact in 2015. "As usual, they took advantage of the U.S. We were in a terrible deal," Trump said. "Would I go back in? Yeah, I'd go back in. I like, as you know, I like Emmanuel. I would love to, but it's got to be a good deal for the U.S."
Aside from discussing temperatures and the Paris climate accord, Trump also dove into comments on Arctic sea ice. On that, too, he made false statements. "The ice caps were going to melt, they were going to be gone by now, but now they're setting records," Trump said, suggesting that polar ice overall is expanding. "They're at a record level." The Arctic and Antarctic saw record lows for sea ice last year. Many scientists fear that the feedback loop from higher temperatures will continue to diminish sea ice, reducing reflective surfaces on Earth. The reduced albedo effect is believed to be contributing to higher temperatures as darker areas absorb more sunlight. Scientists expressed dismay at the president's interpretation of climate science. "This is insane," tweeted Jon Foley, executive director of the California Academy of Sciences, referring to a story about the president's comments in Britain's Independent newspaper. "Trump has access to the best scientists in the world, but he gets his science information from cable tabloid shows and talk radio." Peter Gleick, co-founder of the Pacific Institute, tweeted: "It's not surprising Trump spouts incorrect, deceptive #climate nonsense: he is scientifically illiterate, has no science advisor, and gets his only information from a talk show with people equally ignorant and intentionally misleading."